As the holidays inch closer and closer, the staff and volunteers at Roswell’s three historic homes already are knee deep in Christmas preparations. Bulloch Hall, Barrington Hall and Smith Plantation are always adorned for the season in themes that are elegant, whimsical and visually sumptuous. Bulloch’s theme changes from year to year, with individuals and groups each doing a part of the antebellum home. Smith Plantation traditionally incorporates vintage items from the generations of families who have lived there into its decorating scheme. And last year the Roswell Garden Club spearheaded all of the decorating at Barrington Hall using Christmas wishes as its inspiration. But for 2013, there’s a new plan afoot. Prices for the wreaths will start at $30. Open houses are Dec. 2, 9 and 16, when the cost of the tour will be waived. For information on donating or purchasing a wreath, please contact Nancy Halsema at (770) 315-0345 or email Michele Glazer at mglazer@roswellgov.com. Bulloch Hall’s theme for 2014 is presidential. Eleven U.S. presidents will be represented from George Bush to Jimmy Carter, with customs and past-times of these years on display. 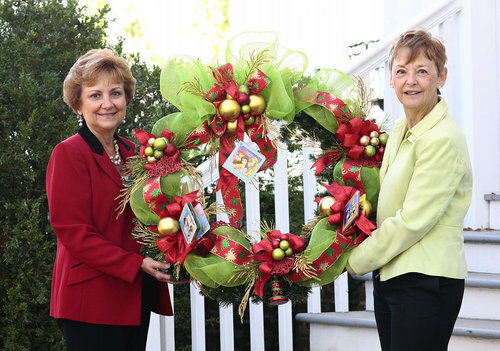 Smith Plantation Home will have “A Georgia Christmas” with decorations by the Roswell Garden Club. Different parts of Georgia will be represented using magnolias, hydrangeas, birds, birdhouses, pinecones, red berries, sea shells and different Georgia landmarks and colleges. For information on the displays and tour dates at these three museum homes, go to www.roswellgov.com and click on Southern Trilogy Historic Homes.